Top-Twenty Broadline Foodservice Distributor to Launch Truly Integrated Receivables Solutions from FTNI to Streamline AR Operations on a Single Platform. OMAHA, Neb. 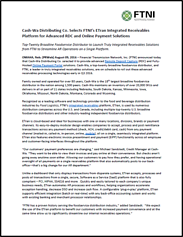 (PRWeb) August 09, 2016 – Financial Transmission Network, Inc. (FTNI) announced today that Cash-Wa Distributing Co. selected it to provide advanced Remote Deposit Capture (RDC) and Fully-Hosted Online Payment Portal solutions. 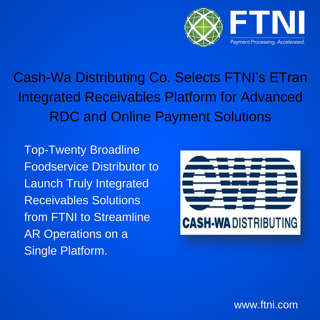 Cash-Wa, a top-twenty broadline foodservice distributor, and FTNI, a leader in truly integrated receivables solutions, are on schedule to roll out these advanced receivables processing technologies early in Q3 2016. Family owned and operated for over 80 years, Cash-Wa is the 18th largest broadline foodservice distributor in the nation among 1,500 peers. Cash-Wa maintains an inventory of over 20,000 SKUs and delivers in all or part of 11 states including Nebraska, South Dakota, Kansas, Minnesota, Iowa, Oklahoma, Missouri, North Dakota, Montana, Colorado and Wyoming. Recognized as a leading software and technology provider to the food and beverage distribution industries by Food Logistics, FTNI’s integrated receivables platform, ETran, is used by numerous distribution companies across the U.S. and Canada, including multiple top-twenty U.S. broadline foodservice distributors and other industry-leading independent foodservice distributors. ETran is cloud-based and ideal for businesses with one or many locations, divisions, brands or payment channels. Its easy-to-deploy modular design enables companies to accept, process and post remittance transactions across any payment method (check, ACH, credit/debit card, cash) from any payment channel (mailed-in, called-in, in-person, online, mobile), all on a single, seamlessly integrated platform. ETran also features electronic invoice presentment and payment (EIPP) functionality across all employee and customer-facing interfaces throughout the platform. Unlike a dashboard that only displays transactions from disparate systems, ETran accepts, processes and posts all transactions from a single, secure, Software as a Service (SaaS) platform that is also fully compliant – PCI, HIPAA, SSAE16 and more . Quickly and easily tailored to each company’s unique business needs, ETran automates AR processes and workflows, helping organizations accelerate exception handling, decrease DSO and increase cash flow. A configurable ‘plug-n-play’ platform, ETran supports efficient integration (batch or real-time) with any back-office accounting system and works with existing banking and merchant processor relationships. Cash-Wa Distributing is a broadline foodservice and convenience store distributor that has been in existence since 1934. Old fashioned service, innovative technologies, and up to date business building strategies help our more than 6,500 customer partners succeed each and every week. Our customer base includes retail discounters, grocery stores, fast food restaurants, convenience stores, health care facilities, schools, and white tablecloth restaurants. Cash-Wa takes pride in the long-standing partnerships that have earned us the distinction of being the distributor of choice for industry leading foodservice operations in Nebraska, Kansas, Missouri, Iowa, Minnesota, North & South Dakota, Wyoming and Colorado. Financial Transmission Network, Inc. (FTNI) accelerates the way businesses accept, process, post and manage payments. Processing millions of transactions monthly, FTNI’s integrated receivables hub, ETran, accepts any payment method, via any payment channel — on a single, secure, cloud-based platform. ETran’s easy-to-deploy, modular design seamlessly integrates current business processes, bank and processor relationships, and back-office accounting software to deliver increased efficiencies and cost savings as a result of true straight through processing. Founded in 2007, FTNI serves more than 18,000 corporate users from leading organizations such as the American Red Cross, Benchmark Senior Living, DirectBuy, Five Star Senior Living, Home State Bank, Independence Bank, Mutual of Omaha Bank, Penn Mutual, Physicians Mutual Insurance, Proxibid, RealPage, Shamrock Foods, The McClatchy Company and many more. For more information, visit www.ftni.com.